Select a Category All Items Allington, Edward Andy and Tamsin Ceramics Art Deco Ceramics Art Deco Metalware Art Deco Prints Art Nouveau Ceramics Arts and Crafts Jewellery Arts and Crafts Metalware Ashtead Pottery Attwell, Mabel Lucie Barometers Bee Ceramics Beswick Bibby, Martin & Judy Black Memorabilia Blue and White transfer china Boch Freres Bonzo Carlton Ware Cartoon & Disney Ceramics Carvings (Wood) Children's China Chintz Christmas Ceramics Circus Ceramics Cliff, Clarice Commemorative China Continental Ceramics J.H. Cope & Co. Ltd Copeland Corkscrews Cowham, Hilda Craven Dunnill Cruets Delphine China Derby Designers Contemporary British Dolls Egg Coddlers Egg Cups (Novelty & Studio) Faience Fielding's Crown Devon Fifties Design Figural Ceramics Goebel Ceramics Golfing Ceramics Glasgow School Glass Greenaway, Kate Grotesque Style (Victorian) Hammersley & Co. Haviland, Theodore De Heathcote China Heubach Brothers AG. Lichte Horner, Charles Horton, David L. Hudson, William Intarsio Italian Ceramics (Modern) Jerusalem Pottery Jugenstil Karakashian Balian Pottery Knox, Archibald Jessie M. King Kitsch Design Lancaster and Sandland Leach, Bernard Liberty & Co. Lingard Webster Lithophanes Luber, J Luck and Flaw Lustre Pottery Majolica Mallet, Beatrice Maw & Son Meakin, Alfred Meakin, J.& G. (Ltd.) Melba Metalware (General) Michell, Roger Midwinter Miniature Ceramics Moorcroft Pottery Murphy, A. 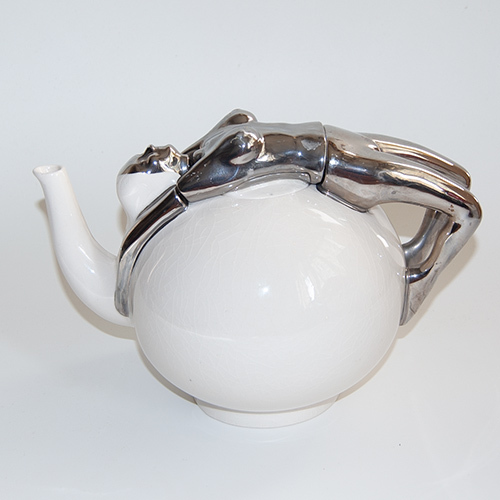 New Chelsea Porcelain Co. Ltd Novelty Teapots Orioli Paragon China Parrish, Maxfield Political Ceramics Portmeirion Pottery Perfume Bottles Preston, Chloe Proctor, Ernest Punch and Judy Quimper Radford, E. Rhead, Frederick Ridgway, J. W. Robinson, J. A. Robinson, William Heath Royal Bayreuth Royal Doulton Royal Dux Royal Venton Ware Royal Worcester Sadler Sandoz, Edouard-Marcel Shelley China Shorter and Son (Ltd.) Silver items Roy Simpson Skiing Ceramics Smith. Nancy Sottsass. Ettore Stanhopes St.Clement Studdy, George Swineside Ceramics Tait, Jessie Teapots Textiles (Japanese) Tiles (Victorian) Toothbrush Holders Troika Upton, Florence Wade Heath Wain, Louis Walking Ware Wedgwood Whistler, Rex Wileman & Co. 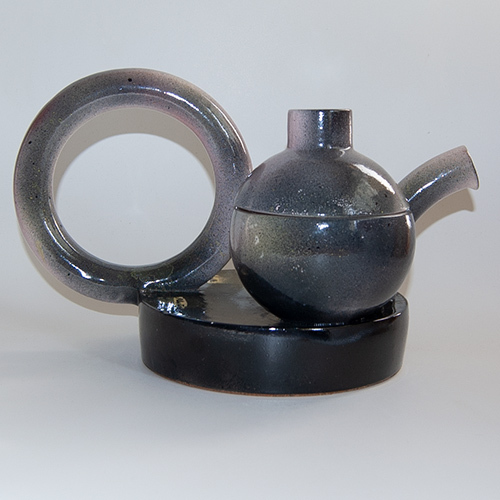 While having a definite appearance of plumbing pipes, this ceramic teapot is likely to have been created by Edward Allington in the 1970s during the period he was using Cubist iconography in some of his ceramic creations. Again, we believe it to be a one off piece as most of his creations were. Hand signed to the top surface in his usual style of scraping away the pigment and signing his surname on the white body underneath, and also with the words "spout" , "body" and "handle" adjacent to those features, inscribed in similar style.